Draft: 2006, Atlanta Braves, 2nd rd. Jeffrey Alan Locke...graduated from A. Crosby Kennett High School (North Conway, NH) in 2006. Spent full season in Majors for third time in career, going 9-8 140 with a 5.44 ERA (127.1 ip/77 er) in 30 appearances (19 starts)... First 17 appearances were starts; posted 8-5, 5.38 marks in that time...Four of 15 appearances after July 1 were starts; went 1-2, 9.92 (16.1/18) in starts, and 1-1, 3.38 in relief... Between May 19 and July 1, factored in decision in all nine starts, going 7-2, 4.92 (56.2/31)... That span included season-long fourgame winning streak from May 19-June 4... On May 30 at Miami, set new career high with 9.0 innings pitched in 10- 0 win (3 h, so); was first career complete game and shutout... Posted 5-2, 3.63 record in 15 games (eight starts) at home, and 4-6, 7.16 mark in 15 games (11 starts) on road...Overall, went 8-7, 5.86 (106.0/69) as starter and 1-1, 3.38 as reliever (21.0/8). Set career highs in innings pitched and strikeouts... Tied his career high in starts...Made first start on 4/10 and won a 6-2 decision at Milwaukee (6.0ip/2er)...Recorded his first career extra-base hit (double) and RBI on 4/10 at Milwaukee...Tied career high with 8.0ip and retired 23 of the last 25 batters he faced while winning his second start on 4/18 vs. Milwaukee...Pitched 5.2 scoreless frames and picked up his third win on 5/26 vs. Miami...Surrendered season-high seven runs (six earned) while losing a 7-1 decision on 5/31 at San Diego...Tossed 6.0 scoreless innings in a nodecision on 6/12 vs. Philadelphia...Retired the last 19 batters he faced while giving up just two hits in 8.0 innings of a 1-0 victory vs. Cleveland on 7/4... Was charged with two earned runs or less in six straight starts from 6/12 thru 7/9 and posted a 1.59 ERA (34.0ip/6er) in that time...Had an RBI-single while losing a 6-1 decision on 7/19 at Milwaukee...Posted a 2.84 ERA in his five starts during the month of July...Won his seventh decision after giving up two runs in 7.0ip on 8/26 at Miami...Suffered back-to-back losses in his first two starts to start the month of September...Won his eighth and final game on 9/12 vs. Milwaukee...Went 3-for-45 (.067) with a double, two RBI and seven sacrifice bunts at the plate. Began season on 15-day disabled list with a right side strain...Made rehab start with High-A Bradenton on 4/9 and struck out 10 batters while throwing 82 pitches in a 3-1 loss...Was reinstated from the D.L. and optioned to Triple-A Indianapolis on 4/10...Went 0-1 with a 5.68 ERA(19.0ip/12er) in four Triple-A starts before being recalled by Pittsburgh on 5/5...Made start vs. San Francisco on 5/5 and took an 8-2 lead into the sixth inning, but received a no-decision in the 11-10, 13-inning loss (5.1ip/6er)...Was optioned back to Indianapolis on 5/6...Picked up first Triple-A win on 5/11 vs. Norfolk (7.0ip/2er)...Gave up just one hit while pitching 7.0 scoreless frames on 5/16 vs. Pawtucket...Won back-to-back starts on 5/22 at Charlotte and 5/27 vs. Buffalo...Went 3-0 with a 2.57 ERA (28.0ip/8er) in five starts with Indianapolis during the month of May...Won three straight Triple-A decisions between 5/11-27...Was recalled by Pittsburgh on 6/8 and made start that afternoon vs. Milwaukee; gave up three hits and just one run in 7.0ip, but lost a 1-0 decision to Yovani Gallardo...Pitched a career-high 8.0 innings (2r) in a no-decision on 6/13 at Miami...Won his first decision with the Pirates on 6/24 at Tampa (7.1ip/3er)...Tied career high with 8.0 innings pitched on 7/1 vs. Arizona...Pitched 8.0 innings for a third time while winning a 6-2 decision over A.J. Burnett and the Phillies on 7/6 at PNC Park...Gave up season-high 10 hits and six runs in an 8-1 loss on 7/26 at Colorado...Won four straight decisions from 8/6-27 and went 4-0 with a 2.90 ERA (31.0ip/10er) in five starts during the month of August...Pitched 7.1 innings and gave up just one run while beating Adam Wainwright, 3-1, at PNC Park on 8/27; also went 2-for-3 at the plate for first career multi-hit game...Was optioned to Indianapolis on 8/30, but was recalled on 9/2 and started that night in St. Louis; gave up five walks and five runs in a 6-4 loss to Wainwright...Tied career high (second time) with nine strikeouts while winning his seventh and final decision on 9/8 at Philadelphia (7.0ip/1er)...Posted a 2.10 ERA (34.1ip/8er) and a .191 batting average against in his five starts during the afternoon...Went 5-for-45 (.111) with two walks and three sacrifice bunts at the plate. Was named to the National League All-Star Game while spending his first full season in the Major Leagues; did not pitch in the game due to tightness in his lower back...Was one of 13 National League LHP to make at least 30 starts...Posted a 2.15 ERA (83.2ip/20er) in 14 starts on the road; the second-best road ERA in the league behind Clayton Kershaw (2.14)...Shared team lead in starts and ranked second on staff in innings pitched...Led the league in walks...Made his first start in team's sixth game on 4/7 at Los Angeles (NL); suffered loss (6.0ip/4er)...Picked up first win in his second start on 4/13 vs. Cincinnati (5.0ip/1er)...Tossed 7.0 scoreless innings and extended his scoreless innings streak to 13.0 with his third win on 4/28 at St. Louis...Had scoreless innings streak snapped at 15.0 after giving up three runs in 5.0ip on 5/4 vs. Washington...Tossed 7.0 scoreless innings in a 1-0 victory vs. Houston on 5/19...Pitched 21.1 consecutive scoreless innings from 5/14-6/4...Walked a career-high seven batters, but held the Cubs to one hit in 5.2ip in a no-decision on 6/9 at Chicago...Gave up two hits while tossing 7.0 scoreless frames for his sixth win on 6/14 vs. Los Angeles (NL); also snapped an 0-for-30 streak at the plate with a single...Pitched 7.0 shutout innings, but received a no-decision in Pittsburgh's 2-1, 13-inning loss at Cincinnati on 6/19...Won his seventh straight decision on 6/25 at Seattle - the first Pittsburgh lefty to win seven in a row since John Smiley in 1991...Pitched 23.1 consecutive scoreless innings at PNC Park from 5/14 to 7/3 - the longest scoreless streak at home for a Pittsburgh starting pitcher since Jerry Reuss (34.0) in 1975...Won his eighth straight game on 7/3 vs. Philadelphia while also setting the club record for most consecutive starts (16) in a season without losing a game (previous mark of 15 was set by Dock Ellis in 1971)...Won eight straight decisions from 4/13 to 7/3; the eight straight wins were tied for the second-longest streak in the N.L. in 2013 and were the most by a Pittsburgh lefthander since John Candelaria won eight in a row in 1983...Gave up three hits and two runs, but lost a 2-1 decision to Bartolo Colon and the Athletics on 7/8 at PNC Park...Missed his last scheduled start prior to the All-Star break on 7/12 due to tightness in his lower back...Attended the All-Star festivities at Citi Filed in New York, but was inactive...Gave up one hit and one run in 7.0ip while winning his first start after the break on 7/21 at Cincinnati...Struck out a career-high nine batters on 7/26 at Miami, but lost a 2-0 decision to Henderson Alvarez...Surrendered four runs in 4.0ip in a no-decision vs. St. Louis on 7/30 - snapping his streak of 17 straight starts in which he was charged with three earned runs or fewer...Gave up 10 hits and season-high eight runs while suffering a 15-5 loss to Arizona on 8/17...Received no-decisions on 8/22 at San Francisco (4.0ip/3er) and 8/27 vs. Milwaukee (4.2ip/5er)...Was optioned to Double-A Altoona on 8/28, but did not appear in any minor league games...Was recalled on 9/3 and made start at St. Louis on 9/7...Gave up one run in 7.0ip and posted his 10th victory on 9/12 vs. Chicago...Lost each of his last two starts on 9/17 vs. San Diego (5.0ip/4er) and 9/22 vs. Cincinnati (1.0ip/5er)...Went 8-2 with a 2.15 ERA (109.0ip/26er) in 18 starts prior to the All-Star break and 2-5 with a 6.12 ERA (57.1ip/39er) in 12 starts after the break...Went 5-for-47 (.106) with two walks at the plate. Was named Pittsburgh's Minor League Pitcher-of-the-Year...Ranked second among minor league players in the organization in ERA and third in strikeouts...Began season with Triple-A Indianapolis and went 3-1 with a 2.31 ERA in his first six starts...Was charged with two earned runs in 26.0ip while winning three straight decisions from 4/18 thru 5/5...Lost back-to-back starts on 5/10 (5.2ip/5er) and 5/15 (7.0ip/3r/2er)...Was recalled by Pittsburgh on 5/20 when Jason Grilli went on the Bereavement List, but did not appear in a game with the Pirates...Was optioned back to Indy on 5/23...Went 3-1 with a 2.86 ERA (34.2ip/11er) in June and 2-1 with a 2.17 ERA (29.0ip/7er) in July...Was charged with just one run over a three-start stretch from 7/23 to 8/3 (19.1ip), lowering his Triple-A ERA from 3.07 to 2.66...Was ranked fourth in the International League in ERA (2.66) and tied for fourth in strikeouts (113) at the time of his recall to Pittsburgh on 8/8...Made season debut with Pirates on 8/9 and retired all seven Arizona batters he faced while making his first Major League relief appearance...Tossed 2.0 scoreless innings in second outing on 8/14 vs. Los Angeles...Was optioned to Indianapolis on 8/16 and went 1-0 with a 1.08 ERA (16.2ip/2er) in his last three Triple-A starts...Allowed just three earned runs in his final 36.0ip (six starts) with Indianapolis (0.75 ERA)...Finished third among International League pitchers in ERA and fourth in strikeouts...Suffered a 5-1 loss while making first start with Pirates on 9/3 vs. Houston (5.0ip/5er)...Went 0-3 with a 7.50 ERA (24.0ip/20er) and gave up six home runs in his first five starts with Pittsburgh...Won his first Major League game while making final start on 10/1 vs. Atlanta...Went 1-3 with a 6.30 ERA in his six starts with the Bucs...Went 1-for-11 at the plate; singled off Chicago's Chris Rusin for first big league hit on 9/9. Finished second among all Pittsburgh farmhands with 139 strikeoutsbehind Kyle McPherson (142)...Went 8-10 with a 3.70 ERA (153.1ip/63er) in 28 minor leaguegames (27 starts) between Double-A Altoona and Triple-A Indianapolis...Was named to theEastern League mid-season All-Star team and tossed a scoreless inning in his home state ofNew Hampshire in the game on 7/13...Began season with Altoona, where he was charged withtwo or fewer earned runs in 16 of his 23 outings...Struck out a season-high 10 batters whileearning first win on 4/25 at Harrisburg...Made first relief appearance since 2008 on 7/4 vs.Akron...Tossed a career-high 8.0 innings while picking up the win on 7/23 vs. New Britain...Recorded a 2.05 ERA (30.2ip/7er) in five starts with Altoona following the All-Star break...Waspromoted to Indianapolis on 8/15...Scattered four hits and struck out six batters in 5.2 scorelessinnings, but picked up a no-decision while making his Triple-A debut on 8/15 at Louisville...Picked up lone win with Indy on 8/31 vs. Toledo after allowing one run in 7.0 innings...Wasrecalled by Pittsburgh on 9/4...Started and lost big league debut (5.0ip/3r) on 9/10 vs. Florida (the Pirates were shut out 3-0)...Surrenderedthree home runs in 4.0 innings while losing the season finale on 9/28 at Milwaukee...Went 0-for-5 at the plate with the Pirates. Went 12-5 with a 3.56 ERA, 139 strikeouts and just 26 walks in 27 total starts between Class-A Bradenton and Double-AAltoona...Led organization in strikeouts and shared lead in wins with Jared Hughes and Rudy Owens...Established minor league career highs in wins,strikeouts and innings pitched (144.0) while matching high in starts...Was named to Florida State League mid-season All-Star team...Began season withBradenton and went 0-1 with a 5.19 ERA (8.2ip/5er) in his first two starts...Struck out season-high 10 batters while winning third start on 4/21 vs.Jupiter...Went 5-1 with a 2.15 ERA (37.2ip/9er) in seven starts from 4/21 thru 5/21, dropping ERA to a season-low 2.72...Suffered last loss with Bradentonon 6/1 vs. Lakeland...Won his last four decisions with the Marauders and walked just three batters in his final six starts (33.2ip)...Was promoted to Altoonaon 7/12 and was victorious in first Double-A start on 7/16 at Harrisburg (5.0ip/0r)...Received three straight no-decisions despite giving up a total of fiveearned runs in 18.0 innings of work (2.50 ERA)...Suffered first Double-A loss on 8/6 at Harrisburg...Pitched in front of nearly 1,000 family, friends andpeople from his hometown of North Conway, NH, on 8/18 at Portland and tossed 7.0 scoreless innings for the win...Went 2-0 with a 0.96 ERA (18.2ip/2er)in three starts from 8/18-28...Suffered loss in last regular season start on 9/2 at Bowie (5.0ip/7er)...Went 1-0 with a 1.54 ERA in two starts during Altoona'sEastern League Championship run...Picked up win in Game Two of the Championship Series against Trenton on 9/15. Went 5-8 with a 4.59 ERA (127.1ip/65er) in 17 combined starts between Myrtle Beach (Braves' A) and Lynchburg...Established career highin starts...Began season with Myrtle Beach and allowed three or fewer runs in seven of his 10 starts with the Pelicans...Tossed 7.0 scoreless inningsand allowed just two hits while winning lone game with Myrtle Beach on 5/1 vs. Salem...Failed to pitch out of the 1st inning (0.2ip) and gave up sevenruns in final start with Pelicans on 5/30 at Wilmington...Was acquired by Pittsburgh on 6/3 and remained in the Carolina League to pitch withLynchburg...Received back-to-back no-decisions before winning his third start on 6/19 vs. Kinston (6.0ip/3r/0er)...Lost his next four decisions thru7/25...Went 3-0 with a 2.58 ERA (45.1ip/13er) in his final eight regular season starts; was charged with one earned run or less in six of those eightstarts...Made two starts during the Carolina League playoffs, but did not factor in any decisions for league champion Lynchburg club. Spent entire season with Rome (Braves' A)...Lost his first two decisions and seven of his first eight thru 6/3...Won first game in sixth start on5/1...Made lone relief appearance on 5/29 vs. Asheville (7.0ip/3er)...Posted a 3.26 ERA (30.1ip/11er) in five starts during the month of June...Won threestraight decisions from 6/20 thru 7/7, but then lost three straight starts from 7/12-23...Pitched 6.0 scoreless frames while winning final game on8/6...Tossed first professional complete game on 8/13 vs. Hagerstown in game one of a doubleheader (7.0ip/2er). Spent entire season with Danville in the short-season Appalachian League...Was named to the league's post-season All-Star team and wasnamed Danville's Pitcher-of-the-Year by the Atlanta organization...Also garnered Baseball America's post-season All-Star team accolades...Tied forsecond in the league in wins and strikeouts...Ranked third in the league with an 11.2 strikeout/per 9.0ip ratio ...Also ranked fourth in the circuit in ERAand fifth among starting pitchers in the Atlanta farm system...Suffered loss in first start on 6/19 vs. Burlington...Picked up first and only pro save insecond outing on 6/22 vs. Bluefield (2.0ip/2er)...Won each of his last seven decisions and was charged with two earned runs or less in each of his final10 starts...Walked a season-high two batters on 7/16 vs. Elizabethton....Dropped ERA from 3.67 to 2.66 over last five starts after giving up just fourearned runs in 26.2ip. Spent first professional season with the Gulf Coast League Braves after beinig selected by Atlanta in the second round of the June draft...Madepro debut in relief and pitched 2.0 scoreless innings for the win on 6/29 vs. GCL Indians...Lost three straight decisions from 7/5-26...Won his last threedecisions and surrendered just one earned run in his final four appearances (14.0ip)...Went 3-0 with a 1.29 ERA (14.0ip/2r/1er) in five starts and 1-3 with a 6.50 ERA (18.0ip/13er) in five relief outings. October 2, 2017 LHP Jeff Locke elected free agency. July 13, 2017 LHP Jeff Locke assigned to Jupiter Hammerheads from New Orleans Baby Cakes. July 9, 2017 Miami Marlins sent LHP Jeff Locke outright to New Orleans Baby Cakes. July 4, 2017 Miami Marlins designated LHP Jeff Locke for assignment. June 1, 2017 Miami Marlins activated LHP Jeff Locke from the 10-day disabled list. May 19, 2017 Miami Marlins sent LHP Jeff Locke on a rehab assignment to Jacksonville Jumbo Shrimp. 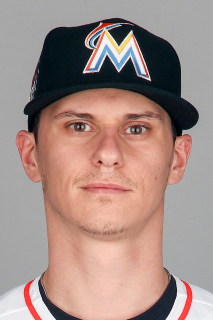 May 8, 2017 Miami Marlins sent LHP Jeff Locke on a rehab assignment to Jupiter Hammerheads. April 2, 2017 Miami Marlins placed LHP Jeff Locke on the 10-day disabled list retroactive to March 30, 2017. Left shoulder tendinits. December 12, 2016 Miami Marlins signed free agent LHP Jeff Locke. December 2, 2016 LHP Jeff Locke elected free agency. November 29, 2016 Pittsburgh Pirates designated LHP Jeff Locke for assignment. October 8, 2015 Pittsburgh Pirates activated LHP Jeff Locke. October 7, 2015 Pittsburgh Pirates reassigned LHP Jeff Locke to the minor leagues. September 2, 2014 Pittsburgh Pirates recalled LHP Jeff Locke from Indianapolis Indians. August 30, 2014 Pittsburgh Pirates optioned LHP Jeff Locke to Indianapolis Indians. June 8, 2014 Pittsburgh Pirates recalled Jeff Locke from Indianapolis Indians. May 6, 2014 Pittsburgh Pirates optioned LHP Jeff Locke to Indianapolis Indians. May 5, 2014 Pittsburgh Pirates recalled Jeff Locke from Indianapolis Indians. April 11, 2014 Pittsburgh Pirates optioned LHP Jeff Locke to Indianapolis Indians. April 11, 2014 Pittsburgh Pirates reassigned LHP Jeff Locke to the minor leagues. April 9, 2014 Pittsburgh Pirates sent LHP Jeff Locke on a rehab assignment to Bradenton Marauders. March 21, 2014 Pittsburgh Pirates activated LHP Jeff Locke. October 12, 2013 Pittsburgh Pirates activated LHP Jeff Locke. October 1, 2013 Pittsburgh Pirates reassigned LHP Jeff Locke to the minor leagues. September 3, 2013 Pittsburgh Pirates recalled LHP Jeff Locke from Altoona Curve. August 28, 2013 Pittsburgh Pirates optioned Jeff Locke to Altoona Curve. September 1, 2012 Pittsburgh Pirates recalled Jeff Locke from Indianapolis Indians. August 16, 2012 Pittsburgh Pirates optioned Jeff Locke to Indianapolis Indians. August 8, 2012 Pittsburgh Pirates recalled Jeff Locke from Indianapolis Indians. May 23, 2012 Pittsburgh Pirates optioned Jeff Locke to Indianapolis Indians. May 20, 2012 Pittsburgh Pirates recalled Jeff Locke from Indianapolis Indians. March 15, 2012 Pittsburgh Pirates optioned Jeff Locke to Indianapolis Indians. September 6, 2011 Pittsburgh Pirates recalled Jeff Locke from Indianapolis Indians. August 15, 2011 Jeff Locke assigned to Indianapolis Indians from Altoona Curve. March 14, 2011 Pittsburgh Pirates optioned Jeff Locke to Altoona Curve. November 19, 2010 Pittsburgh Pirates selected the contract of Jeff Locke from Altoona Curve. July 13, 2010 Jeff Locke assigned to Altoona Curve from Bradenton Marauders. June 19, 2009 LHP Jeff Locke assigned to Lynchburg Hillcats from State College Spikes. June 17, 2009 State College Spikes reassigned LHP Jeff Locke to the minor leagues. June 15, 2009 LHP Jeff Locke assigned to State College Spikes from Lynchburg Hillcats. June 9, 2009 Jeff Locke roster status changed by Lynchburg Hillcats. June 3, 2009 Myrtle Beach Pelicans traded LHP Jeff Locke to Lynchburg Hillcats.